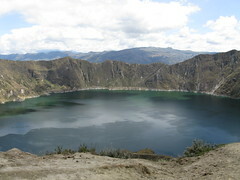 Quilotoa is a lake at the bottom of a volcano crater. It sounded like an interesting day trip because it involved a hike down to the lake. We were picked up early in the morning by our guide and driver. We had signed up for a group tour before we went to the Galapagos and did not know whether there would be other people coming with us or not. Turns out the answer was no – so we had our own private tour while only paying the group rate (sweet!). We headed out of the city and went South. We were lucky because the clouds hadn’t rolled in yet and the views were spectacular. 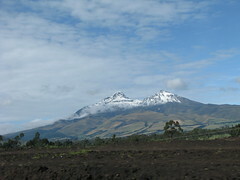 We saw many snow-capped volcanoes along the way. The drive was about three hours long. 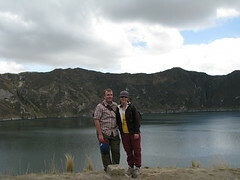 We arrived at Quilotoa around 11am. After paying our entrance fee, we headed down the path to the lake. The path was quite steep and in some places very sandy, which made for some interesting hiking! We walked for about 45 minutes downhill to the lakeside. Apparently the lake is very deep (some say 250m! ), and also quite acidic with gas bubbling up in a few places. It was a beautiful setting. We had a snack at the bottom while we waited for our donkeys. 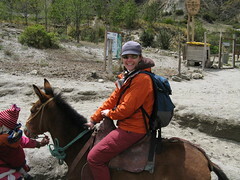 At the top, we had had to decide whether we wanted to walk back up or rent a donkey to carry us back up the crater. It was quite steep and we were at an elevation of about 3,800m. Having just returned from sea level where we had spent the last week, we opted for the donkeys – somewhat due to our guides subtle pressure but mostly after climbing a set of 6 steps winded us! We could have walked, I’m sure, but as a result of opting for the donkeys we had quite the adventure! Donkeys are interesting animals, and when on one you have basically no control over the donkey. Dave and I each got on our donkeys. My donkey was in the lead, his behind me. A local woman walked behind his donkey, slapping its behind all the way up the crater and shouting “mula mula” (which means donkey). It was one of the most frightening experiences of my life! The path was very steep and the ground very loose, and there were many sections along cliff edges. I probably would have felt a lot more comfortable if I hadn’t kept picturing in my mind the donkey I saw fall off a terrace (about 1-2m high) one time in Bolivia! The donkeys we were on would climb up for a few minutes then stop to take a break. On steep sections they would kind of gallop up, and stop just short of the cliff edge! They kept getting a lot closer to the edge than necessary! Of course, it seemed worse than it really was – when looking down it seemed like I was very close to the edge, but the donkey’s feet were probably a foot from the edge. Apparently Dave’s donkey also had a bad case of gas! When we finally reached the top we were both very happy to be there and to get off the donkeys! We ate a picnic lunch we had assembled ourselves at the top of the crater as dark clouds rolled in. It was quite chilly and we were happy to get back in the car and head back. The three hour trip seemed long, but we eventually made it back to Quito and had a nice dinner in town. All in all it was a good day trip, although a bit far from Quito; it felt like we spent most of the day in the car. With hindsight, based upon the three day trips we took, this would be the one we would least recommend. Submitted by healthybeauty (not verified) on Sun, 2018-04-01 02:33.